1. 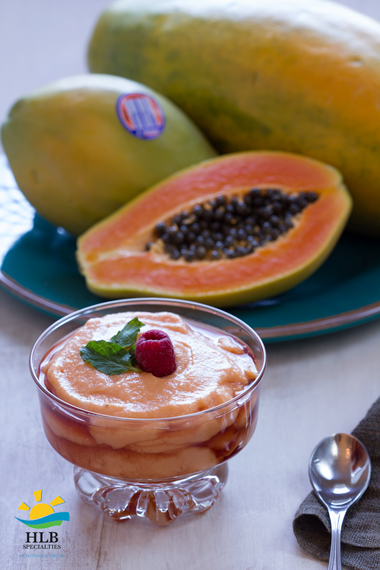 Blend together 1 small papaya (or a ½ large papaya) with 4 scoops of vanilla ice cream. 2. In each serving bowl, pour 2 teaspoons of Crème de Cassis liquor. 3. Pour the papaya and ice cream mix into the bowl. 4. Add a mint leaf as decoration. 5. Enjoy the light and refreshing taste of Crème de Papaya. In a small bowl, whisk together the olive oil, lime juice, parsley, 1 tbs of water and tAbasco. Stir in the capers, red pepper flakes, salt, pepper and sugar. The vinaigrette will keep, tightly covered, in the refridgerator for up to 2 days. Place the crabmeat in a medium mixing bowl and using a fork, break it into bite-size pieces. Add the peas and onion and combine well. Stir in the vinaigrette, salt and pepper and toss to coat. Slice a small piece off of each papaya half along the rounded edge and place on a plate. Spoon one quarter of the crab mixture into each papaya half, garnish with lime wedges and serve. In a small bowl, whisk together shallot, vinegar, olive oil, salt, and pepper. Set aside. In a large bowl, combine lettuce leaves, arugula, and sprouts. Add vinaigrette and toss carefully. Divide greens and sprouts among 4 plates. Cut papayas lengthwise in half. Remove and discard seeds and scoop out papaya pulp with a melon baller and place on salad. Add toasted pine nuts and enjoy! You may also dry the papaya seeds and use them as a replacement for the pepper seeds next time. Blend in another 1/2 cup ice cubes if desired to thin the smoothie mixture to desired consistency. Divide the mixture among 4 chilled large glasses and garnish each smoothie with a lime slice. Put all ingredients into blender. Blend well until smoothie consistency is reached! Mix shrimp, mayonnaise, lemon juice, curry powder, chutney, salt and pepper together. Cut papayas in half and remove seeds. To serve, pile shrimp salad into papaya halves. Pour into glass and serve. Enjoy! If possible, juice papaya and orange first. Blend juice with banana and ice until smooth. In a blender, process ripe papaya, thinned with a little pineapple juice, spiked with coconut or spiced rum and ice. To make it a sweet-heat cocktail, add just a small amount of finely minced, dried hot chili pepper, like a bird’s eye chili or something similar. Garnish with freshly grated nutmeg.